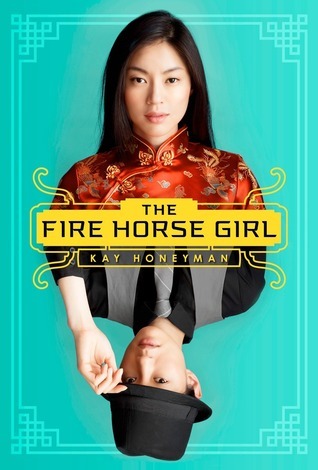 I've invited Kay Honeyman, author of The Fire Horse Girl, which I read, REVIEWed, and fell in love with earlier this month, to kick-off this feature for me today! Jade Moon is a Fire Horse -- the worst sign in the Chinese zodiac for girls, said to make them stubborn, willful, and far too imaginative. But while her family despairs of marrying her off, she has a passionate heart and powerful dreams, and wants only to find a way to make them come true. Then a young man named Sterling Promise comes to their village to offer Jade Moon and her father a chance to go to America. While Sterling Promise's smooth manners couldn't be more different from her own impulsive nature, Jade Moon falls in love with him on the long voyage. But America in 1923 doesn't want to admit many Chinese, and when they are detained at Angel Island, the "Ellis Island of the West," she discovers a betrayal that destroys all her dreams. To get into America, much less survive there, Jade Moon will have to use all her stubbornness and will to break a new path . . .one as brave and dangerous as only a Fire Horse girl can imagine. I work in a middle school. It wasn’t the first time that I had heard open horror at the idea of spending long stretches of time with teenagers. The truth is I love teaching middle school. Sure, there are storms of drama, tornados of emotion, and more than a few icebergs of attitude to navigate. But teenagers are real. They construct tissue paper personas to protect the new skin of their identity that is starting to form. Contradictory elements of who they are bump against one another. It is a mess. A mess that they try desperately to hide. But I think that I am lucky that I get to see glimpses of these chaotic brushstrokes blending into a painting of what they will become. Since I spend so much time in the world of adolescents, it is not surprise that Jade Moon is struggling with her own identity in The Fire Horse Girl. Jade Moon was bold and stubborn before my research let me to the label “Fire Horse girl.” It was a perfect match for her strength because now she would have to battle the world for the right to have that strength. And that is what I want my students to understand, identity isn’t just being who you are, it is also owning it and discovering its possibilities rather than letting others tell you its limits. Jade Moon’s identity as a Fire Horse girl is frustrating – to her, to her family, to her village. It doesn’t conform to society’s neat labels. But it is also full of possibility. Just like the identities in all of us. So the soldier I met in the airport was right. Middle school can be terrifying. They can’t tidy up their identities yet. They force us to see the capacity of human beings, and how widely we will have to spread our arms if we want to catch hold of it. I loved this idea! I have had a lot of book crushes, and it made me think about all the different forms of love that I feel for books. There are books that I want to hold close, books that I want to tell the world about, books that break my heart but which I love anyway. And it is probably no surprise that all my book crushes deal with identity and characters who find the strength to define themselves rather than let their societies define them. Gigi, Bea, and Neerja are best friends and the smartest people in their sophomore class. They plan to pay their dues in high school before life really begins in the Ivy Leagues. Finding an unsigned yearbook under Nejeera’s sister’s bed forces them to take on challenges of a non-academic nature which will teach them a lesson they haven’t learned in class – people are not always what they seem on the surface. This book challenges a lot of the stereotypes that exists in high school. I also have a crush on Strohmeyer’s new book - Zoe Makes her Dreams Come True (available April 2013). This is my most recent crush, and it is one of those heart-wrenching crushes where you know you will get hurt, but I fell and fell hard for it. Arn Chorn-Pond was eleven years old when the Khmer Rouge seized power in Cambodia and began a brutal reign. The book is structured as a piece of fiction, but it is based on the recollections of Arn who is a real survivor. The story is heartbreaking, beautifully written, and tragic. It showed me how tragedy can bring out the darkest parts of human nature along with the divine. I loved McCormick’s earlier book Sold, about a girl sold into sexual slavery in Nepal, and have always admired her unblinking gaze as she takes readers through difficult topics with grace and empathy. I have had a crush on this book for years. This is not a recently released book, but Justina Chen’s new novel is out, Return to Me, and since it is sitting beside my bed, waiting to be read, I’ve been thinking a lot about this old flame. Terra is beautiful. She has the figure, she has the features, she even has the hot boyfriend, but she also has a port wine stain on her face. She tries to hide it with makeup. But it isn’t until she meets Jacob (goth Chinese boy, every good story needs one) that she starts to wonder if she deserves to be more than just a pretty face. It is a dense story, and I admire Chen’s ability to get layer after layer from the characters and events. Well...what did you think? Do you like the feature? Have you read any of Kay's recent book crush novels? How about mine? Will you be reading The Fire Horse Girl anytime soon? Love this feature! And fantastic list! Two of them are books I rated 5 stars. North of Beautiful was amazing and I also loved Smart Girls Get What They Want. I'm really looking forward to reading this book as well! I have two of these on my shelf (North of Beautiful and Never Fall Down) and it sounds like I need to read them soon.. Especially since North of Beautiful is one of your favourites. What a cool new feature! And I love Kay's choices—North of Beautiful is one of my favorites, and Never Fall Down was amazing, though painful. I clearly need to read Smart Girls because Kay has excellent taste. And I can't believe I haven't read The Fire Horse Girl yet! I bought it after reading a review on Great Imaginations, and each review after made me want to pick it up more, but my schedule has been crazy. This is a nice reminder that I need to make time for it. Thanks for sharing! 1) I LOVE this feature, Keertana! Seriously, good for you, I LOVE guest posts, but am heretofore still too shy to every approach anyone to do them, so I have serious admiration for those of you who do. 2) I love this post! Middle school IS terrifying...I think a lot of adults look back on it as one of the most awkward times in their lives. Strangely enough, 7th grade is one of the years I remember best in life. 3) I love the list of book crushes, particularly because they're all books I've seen around, but have pretty much ignored till now. I'm especially interested in checking out North of Beautiful. I'm so glad Kay stopped by! FANTASTIC new feature, K! I really liked Smart Girls Get What They Want - it's so fun and I can't wait for Sarah's new book. And North of Beautiful is defo on my to-read list. Also, Kay's guest post is so beautifully written! What a great idea for a feature. I am so wanting to read this after your wonderful review. I need to read North of Beautiful. Thank you so much for sharing this today! LOVE THIS KEERTANA! Such a fun idea and a great way to introduce us to new authors or helps us get to know favorite authors better:) I haven't read any of the 3 books she listed, I'll need to remedy that asap. I've heard nothing but awesome things about Kay's book, so it's on my absurdly long list as well. Looking forward to this feature moving forward! This feature is really wonderful and I just LOVED The Fire Horse Girl and am super glad to see it gaining some traction among other bloggers. Middle school is awesome -- I do a ton of presentations and run a group for middle school boys and it's so much fun. I can see why some people would be scared, but I personally love it. I have not read any of those books -- but have recently purchased Never Fall Down and North of Beautiful and Smart Girls is sitting on my night stand. I'll be sure to get to them soon! I love this new feature, by the way! I'm looking forward to the future posts. I love you new feature, dearest. It feels very you and quirky! I wish you best of luck and I'm eager to see future posts. I now have a couple of new books to add to my wishlist. North of Beautiful sounding one of the best ones. I'm definitely looking forward to reading both those and Kay's book. This is a really cool idea! I am veryinterested in Never Fall Down now. 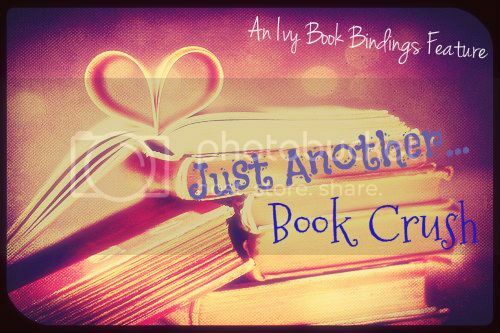 Adding it to the TBR list :) I eagerly await the next Just Another...Book Crush post! I love the new feature, I mean who can't love a book crush. I could just sit there dream about one I've just read. Such a brilliant idea! Personally I haven't read this book, but I've have seen it around and looks like something I would enjoy! I always think that a guest post immerses the reader into something different because they have the skill to persuade you into buying the book without so much as looking at the review! I totally agree! "They construct tissue paper personas to protect the new skin of their identity that is starting to form. Contradictory elements of who they are bump against one another. It is a mess. A mess that they try desperately to hide. But I think that I am lucky that I get to see glimpses of these chaotic brushstrokes blending into a painting of what they will become. " <---- I love this! Fantastic book crushes! North of Beautiful in particular is one I am crazy eager to read! Thanks Kay and Keertana for putting these four fab books on my radar! I remember how much you liked The Fire Horse Girl. In fact, I added it to my tbr and my TBD wishlist the second I finished reading your review. And this is such a wonderful idea! I love guest posts, but I always have trouble coming up with a topic for the authors. This pretty much solves that problem for you. Also, this: "And that is what I want my students to understand, identity isn’t just being who you are, it is also owning it and discovering its possibilities rather than letting others tell you its limits." What an amazing feature and a fantastic idea! I am continually impressed with the quality of your blogging. I'm not sure I would have the courage to do something like this. I think I missed your FIREHOUSE GIRL review, but from this it sounds like an amazing book. I always love getting a glimpse inside an author's own mind, because it definitely affects what she/he writes. I LOVE what Kay Honeyman said about identity. That it's OWNING who you are. The only book that she mentions that I've read is NORTH OF BEAUTIFUL, which I really enjoyed. But I do love Patricia McCormick's book SOLD, although it caused some ugly tears. I'm sure her new one will be equally heart-wrenching. Looking forward to more of these!! I have been waiting for this post! I was so excited when you teased me about it, Keertana. Love the meme idea and I'm really excited about reading Kay's book sometime. I have to admit, I was not a huge fan of NORTH OF BEAUTIFUL, but I think I am about 2% of the population with that view, hah. I will have to check out the other book crushes mentioned, though. Thank you both for this post!